Made a larger version of the 2 Pack. The design is the same, just wider. The LEDs are now in a 2x2 matrix, which requires only 2 resistors. This is run by an Arduino sketch with an interrupt driven LED scan. This allows for multiple levels of brightness and reactive lighting. 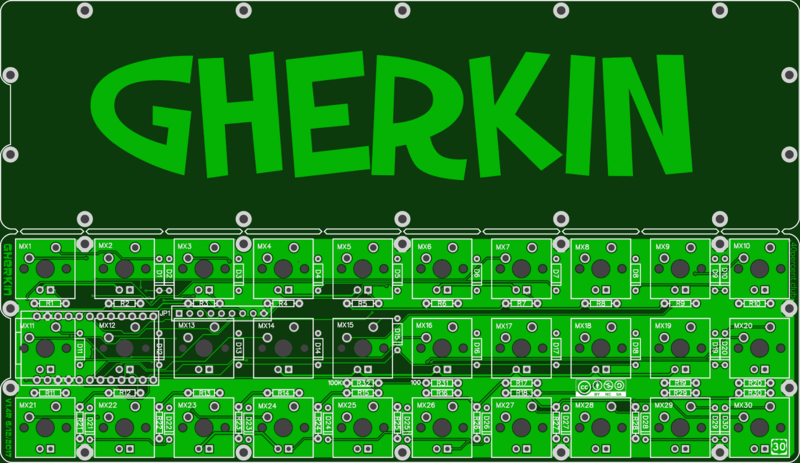 The combined board is a perfect 77.4mm square. It is small enough for the $2 for 10 special at EasyEDA.com. Two assembled macropads. The left one has been sanded down to the bare FR4 material. The PCB before and after splitting and sanding the edges smooth with sandpaper. Side view. The Pro Micro's are socketed. Low profile sockets were used. USB connector end. The notch in the bottom plate allows for large USB connectors. Connected two FML macropads with a micro USB OTG cable. While the fiberglass construction of the FML would be quite sturdy, the USB connectors on the Pro Micro's will probably break off the first time you hit something with it. I dyed some PCBs blue. The soldermask was sanded down to the bare FR4 fiberglass surface. I tried 3 different dyes, each for 15 minutes simmering on a hot plate. The first dye was Rit Denim Blue. After 15 minutes there was no noticeable coloring. The second was Rit Dyemore Blue. Also no noticeable change after 15 minutes. Finally iDye Poly Blue. After 15 minutes it was a deep blue. I left it in for another 5 minutes and it didn't seem to get any darker. I found this post where it took almost 2 hours to dye with regular Rit dye. So it can be done if you have a lot of time. I have also dyed some purple PCBs. 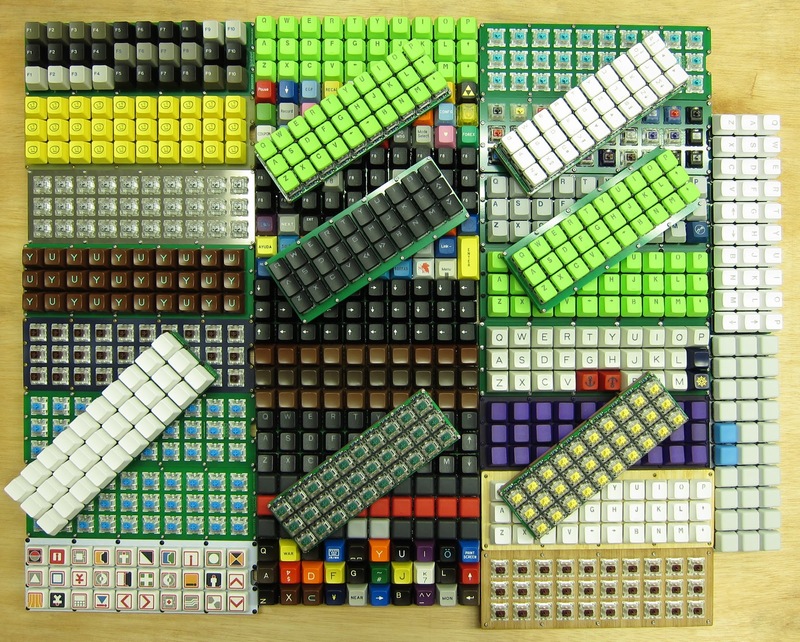 The keycaps are from a PMK grab bag. They are upside down. The pink one is the correct orientation. Six Pack with Outemu Teal switches. I also dyed a Gherkin plate and a 2 pack plate at the same time. I did not have separate cases for the two halves so I put both in one of the plates I made for a Planck. The switch spacing for a Planck is 19mm and the Let's Split is 19.05mm. The difference is small but it shows. There is a slight bowing of the plates. Being only 6 columns wide reduces the total offset. If it were a single 12 column PCB the offset would be 0.55mm from end to end. As it is there is a 0.25mm offset for each side. Socketed Outemu teal switches were used so this can be disassembled and put in a new case later. The TRRS cable is a bit short for normal split use. They are a good length for a permanent umbilical. Sort of looks like crab eyes. I flash my Pro Micro's with the Atmel DFU bootloader. With the default fuses the JTAG port is enabled by default and needs to be disabled to use Port F. Adding the following code to matrix.c in the matrix_init function will disable JTAG. // To use PORTF disable JTAG with writing JTD bit twice within four cycles. Crab eyes sticking out the top. The Pro Micro's stick out from the front. 12mm spacers. I used a low profile socket on one side and a full height on the other. A notched ground between the two PCBs for the center post. Small notches on the top and bottom of each PCB. Jumper to fix a scratched trace.